I hear that next week is Thanksgiving! That means yummy food and the National Dog Show. It also is a nice reminder to be thankful for good things in our lives. Readers, I am thankful for YOU. I have loved the wonderful stories and photos you have shared of your fur-kids in Rescue Spotlights and Pet Meet and Greet posts here. I enjoy every single comment that you leave, especially the ones about your pets. Thank you for visiting my blog and for loving animals and for supporting rescue! 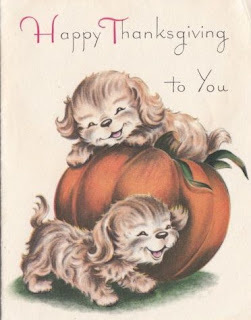 Today I will just share a few vintage Thanksgiving images with you. 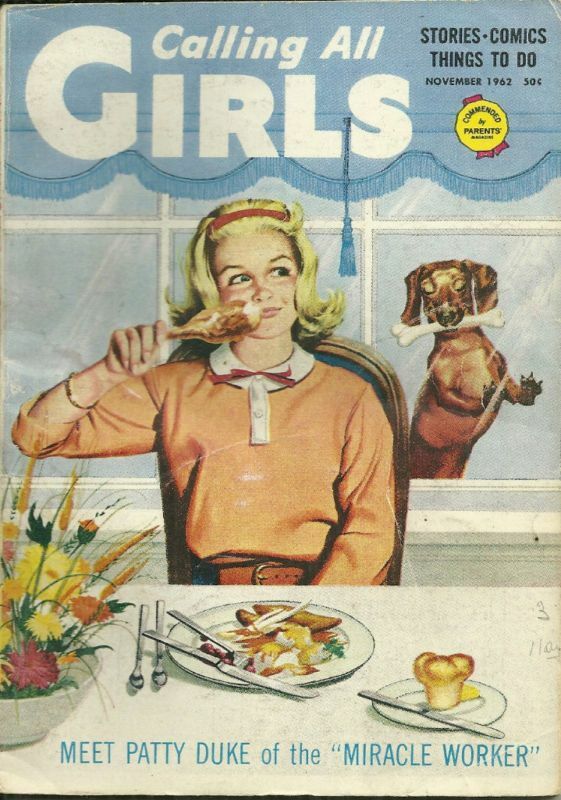 Above, you will see a girl eating turkey while her dachshund watches. (He has a bone to chew on.) It is a cover illustration of Calling All Girls magazine from the early 1960's. 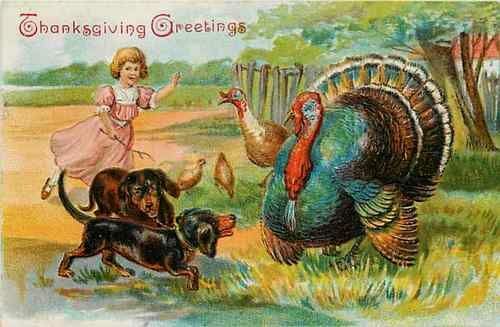 Below you will find a vintage postcard showing two black and tan dachshunds meeting some turkeys. I wonder how that went?! This vintage Thanksgiving greeting card features two little puppies playing on a great big pumpkin. That looks like fun! 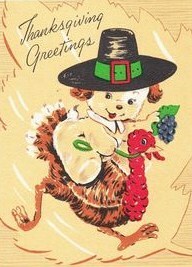 This is another vintage greeting card (1940's). It shows a little terrier dog actually riding on a turkey! Thank you again for stopping by! What are you thankful for this year? If you have pets, do they get special treats on Thanksgiving? I'd love to hear from you in the comments, below. 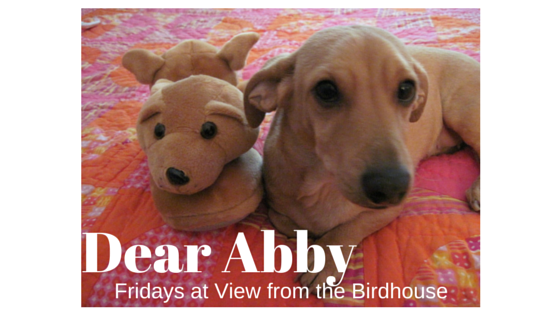 Thank you, Abby, for sharing all of the heartwarming stories about the pets you feature and the wonderful families they have. It is a pleasure to have your blog pop up in our news feeds every Friday morning. Also, you find the most delightful vintage images, which always make us smile. We look forward to many, many more happy blogs! That's so cute how your dog "blogs" on Fridays! Lol it's so adorable. We just got my dog after Thanksgiving last year, so I'm not sure what special treat my mom has planned for him this year. How cute! I love vintage holiday photos and cards. Your dog is so cute! First of all, I am thankful for YOU, Abby, and for your sweet Mom, Trish! Barbara Kelly said it so well, and I too look forward to your continued Friday blogs. These vintage cards are fantastic! Thank you all for visiting! I enjoyed reading your messages. We had a great holiday, and I hope you did too!